The Amerock BP19012CSG9 Bar Pulls 7-9/16in(192mm) CTC Pull is finished in Sterling Nickel. Modern functionality meets straightforward styling. Simple. Bold. True. The sleek and sophisticated design of the Bar Pulls Collection makes a statement with clean lines and smooth textures. Sterling Nickel is a cool, smooth and metallic silver-toned finish that is timeless and subtle. The Amerock BP55277GM Blackrock 5-1/16in(128mm) CTC Pull is finished in Gunmetal. The BlackRock collection offers sleek simplicity with a contemporary indulgence. This eclectic line boasts bold shapes and sizes. Elegant and eye-catching, Gunmetal is the perfect alternative for those who love metallic, but prefer a hint of subtlety. Use this finish to enhance the modern ambience of stainless steel and black appliances without overwhelming their natural gravity. The Amerock BP29364PN Candler 6-5/16in(160mm) CTC Pull is finished in Polished Nickel. The Candler collection is distinctively elegant, with strong lines and soft curves that blend a touch of femininity with enduring class and timeless character. A modern metallic finish, Polished Nickel offers the beauty and luster of sterling silver without the cost or care it takes to maintain. 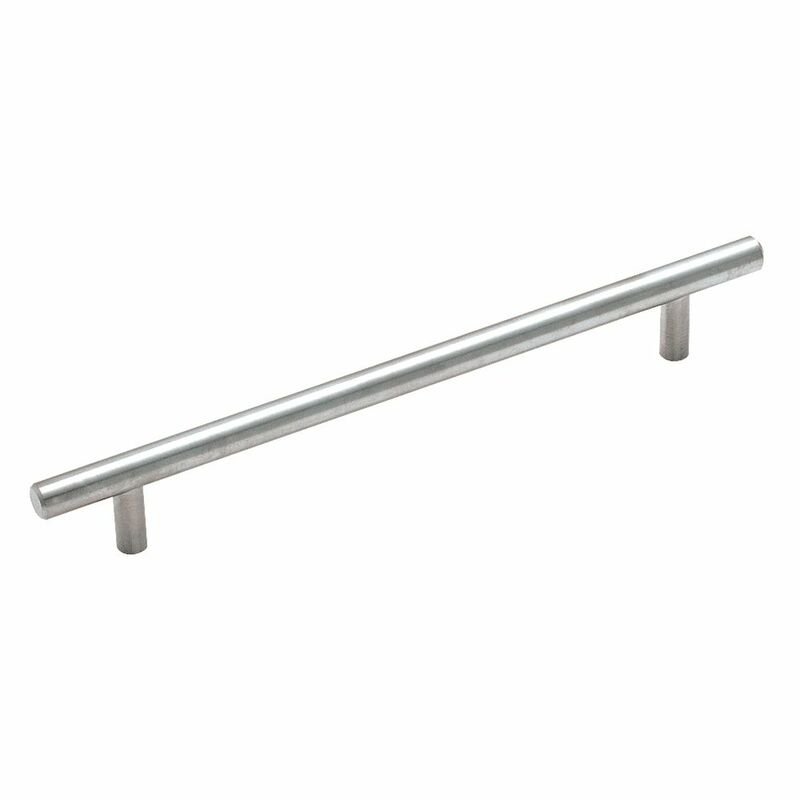 The Amerock BP36595G10 Crawford 6-5/16-inch (160 mm) CTC Pull is finished in Satin Nickel. The Crawford collectionbrings together fine lines and smoothtransitions to create accents with unforgettable style that never fades into the background. The classic Satin Nickel finish provides a sleek, lightly brushed, warm grey metallic look. Amerock markets decorative hardware solutions that inspire, coordinate and help express personal style. For the kitchen, bathroom and the rest of the home, with a variety of finishes and designs for all decorating tastes, Amerock is the ultimate, time-tested source for hardware needs. Amerock markets products in four categories: decorative hardware, decorative hooks, bath accessories and functional hardware. The Amerock Esquire 6-5/16in(160mm) CTC Pull is finished in Polished Nickel/Gunmetal. Innovative, ground-breaking ideas are the inspiration that drives Esquire. This striking mixed media collection pairs upscale finishes with textured accents that puts any room on the cutting edge of design. Elegant and eye-catching, Gunmetal is the perfect alternative for those who love metallic, but prefer a hint of subtlety. Use this finish to enhance the modern ambience of stainless steel and Black appliances without overwhelming their natural gravity, while Polished Nickel offers the beauty and luster of sterling silver without the cost or care it takes to maintain. Bar Pulls 7-9/16 Inch (192mm) CTC Pull - Sterling Nickel The Amerock BP19012CSG9 Bar Pulls 7-9/16in(192mm) CTC Pull is finished in Sterling Nickel. Modern functionality meets straightforward styling. Simple. Bold. True. The sleek and sophisticated design of the Bar Pulls Collection makes a statement with clean lines and smooth textures. Sterling Nickel is a cool, smooth and metallic silver-toned finish that is timeless and subtle. Bar Pulls 7-9/16 Inch (192mm) CTC Pull - Sterling Nickel is rated 5.0 out of 5 by 1. Rated 5 out of 5 by Dawn from They look great!... They look great!